Facebook may soon be ready to squeeze more money out of its 1.3 billion-user chat app. The company has internally developed “Messenger Broadcast,” a self-serve mass-messaging interface that lets businesses send marketing messages to users. Facebook confirmed to TechCrunch that it’s testing the feature internally, but hadn’t trialed it to the public or with businesses as of late last month. While the company was cagey about the functionality, it appears that businesses design a welcome message, message title and subtitle, and include a call to action to the user such as visiting the business’ website, prompting a Messenger bot or tapping to send a preset reply written by the business. Companies can preview their message within the Messenger Broadcast interface or on Messenger itself. As for who the message can reach, the interface outlines that a certain number of users will receive it at no cost to the business. It’s unclear whether businesses will be able to pay for more reach, but that seems like a reasonable direction for the product. Messenger Broadcast was first spotted by tipster phwd, which was reshared by The Next Web’s Matt Navarra. Facebook has been cautious about monetizing Messenger, lest it hamper its growth. But over the past few years it’s started offering Facebook News Feed “click to message” ads that start conversations with businesses, allowing certain partners to send Sponsored Messages directly to users with the help of Facebook’s ads team, and in July it began globally injecting display ads into the Messenger inbox. 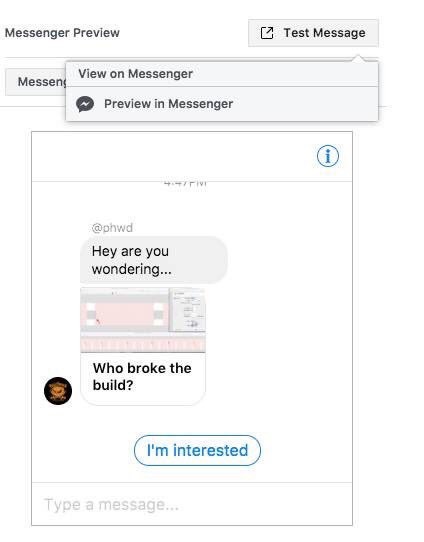 Facebook tells me that regardless of what happens with Messenger Broadcast, it has no plans to change the policy of requiring people to have initiated message threads with businesses before they can message the users with ads or otherwise. That means businesses may need to coax users into pinging them first before they can reach them through Messenger Broadcast. Though again, it’s possible this never rolls out. Facebook will need to be careful here if it does launch the product. If Messenger feels spammy, users might not open chats from friends because they’re lost amongst the ads, or flee back to the status quo of SMS. But with Messenger and Facebook’s acquisition of WhatsApp now the dominant cross-platform messaging apps around the world beyond China, Facebook may finally feel that Messenger is big and dominant enough to start earning its keep.